European-East Asian Borders is an international, trans-disciplinary volume that breaks new ground in the study of borders and bordering practices in global politics. 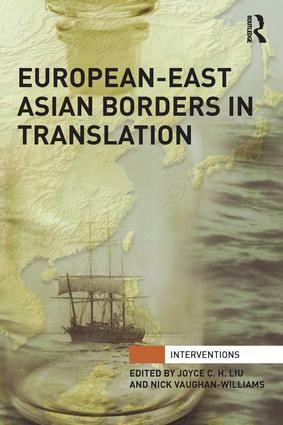 It explores the insights and limitations of border theory developed primarily in the European context to a range of historical and contemporary border-related issues and phenomena in East Asia. The essays presented here question, rather than assume, the various borders between inclusion/exclusion, here/there, us/them, that condition the (im)possibility of translating between histories, cultures and identities. Contributors suggest that the act of translation offers new ways of thinking about how border logics operate, taking on the concept of translation itself as border problematic and therefore raising questions of power and authority, such as who gets to act as a translator, or who benefits from the outcome. The book will appeal not only to upper-level students and scholars with a geopolitical-historical interest in East Asia, but also to those who work in the inter-disciplinary field of border studies and others with an interest more generally in translation and the extent to which theory ‘travels’ across time and space.